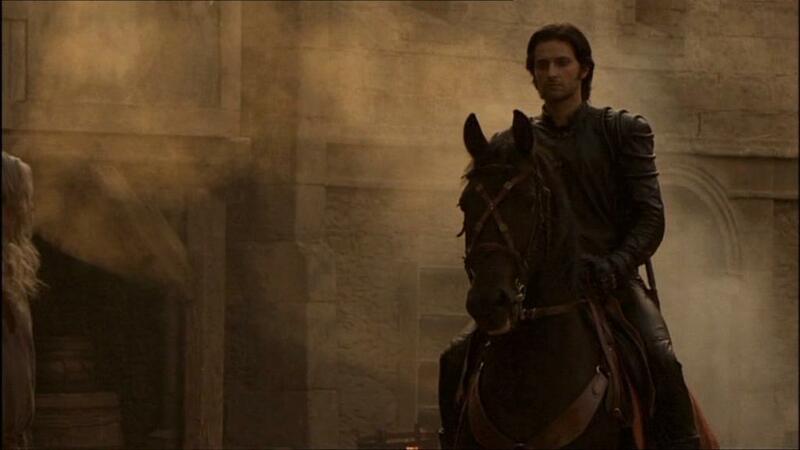 Today’s screencap of Richard Armitage as Sir Guy of Gisborne was contributed by Elaine who runs a photography blog: A Scattering. She recommended the song “Rolling in the Deep” by Adele. Thank you very much, Elaine! Then I brightened this second image to a lesser degree. I added some mist using the Filter > Render > Clouds command and erased enough to allow us to see Sir Guy but left it around the edges of the graphic. I’ve seen the effect of a character and a contrasting shadow before and always wanted to try using this idea. It fit so well with this graphic. 🙂 I blurred this image of the chess piece, rotated it and lowered its opacity so it looked like a shadow. The text “Knight in Action” was written with the QueenEmpressCapitals font and I used the Warp Text button to give it the wavy effect. Finally I added a drop shadow to the text. 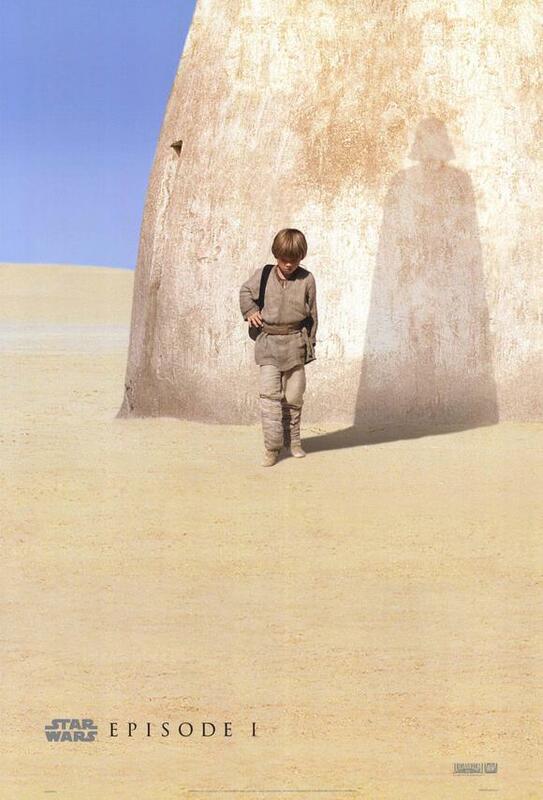 Have you seen this poster for Star Wars Episode 1: The Phantom Menace before? It’s an example of the shadow effect. If your shadow could look like anything at all, what would you choose? Would your neighbors notice? This entry was posted in Collaborative Project, Graphics, richard armitage and tagged actor, adele, graphic a day in may, graphics, guy of gisborne, richard armitage, richardarmitagenet, robin hood, rolling in the deep. Bookmark the permalink. But I don't know if anyone will notice, lol. When I was 15, I read “Ivanhoe” and completely fell in love with knights of old. This graphic today so reminds me of that book. I LOVE it. As for what “shadow” I would want? A dolphin. Definitely, a dolphin. Lovely photo choice, Elaine! I’d forgotten about this episode, and your photo makes me want to go back and watch it. And of course, love Adele! Cool shadow effect, bccmee. Mine would be a wolf. What would yours be? Richard sits magnificently in the saddle! Excellent choice Elaine and another corker from Bccmee! Great work as usual, Bccmee – you are very talented. Bccmee, thank you , thank you, thank you – I LOVE it!! The second photo choice and the shadow effect are perfect choices. As for your question – like mersguy, I’d like my shadow to look like a soaring bird. Maybe an Eagle or another large bird like a Red-tailed Hawk. The freedom, the beauty, the view! Thanks again. Have a great day everyone. A soaring bird sounds like it’ll make a great shadow for you. Maybe it already is. RA gently riding his horse back to die with Marian made me swoon the first time that I saw it. Though they didn’t end up dying–then–it’s the thought that counts. Ha! What a view! Sir Guy gloomily riding out of the castle, ready to face his death during the imminent siege. You put together two things I adore: Sir Guy and chess! Wonderful. Fanastic choice of graphics and music. Perfect combination. Love it. My shadow would probably be a cat! Love the siggie(and the song. I don’t know anyone who doesn’t love Adele). I like Carla’s idea of using it as a bookmark. My shadow would be a butterfly. Chequemate Team 30. Knight takes Queen – I’d love to play THAT shadowy game where I was the queen, lol. I love it! 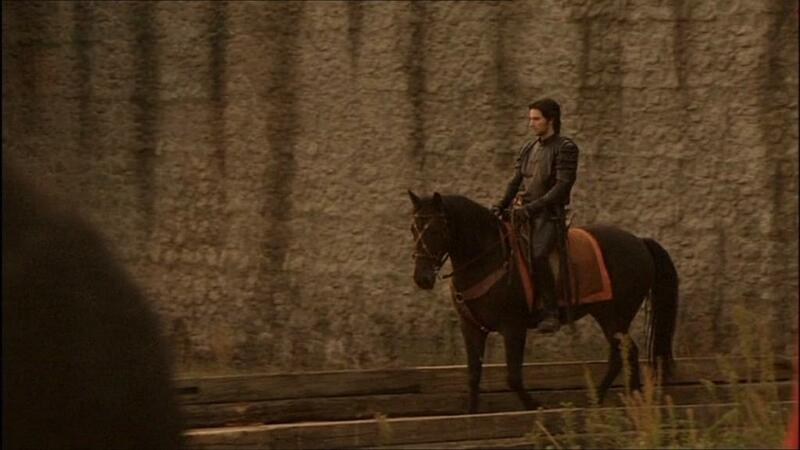 Sir Guy on a horse looks so stunning!!! I like the results of your work. You put in great ideas. My shadow would be a finely dressed Victorian gentleman from England. Then I wouldn’t be bored with him beside me. Wow, I really like this one. Very creative! I stood with my mouth open when I saw this. Each time more you make up amazing things,Bcc.I loved this picture chosen by Elaine.Guy is a character I´ll never forget in my life.I love Thorthon,Lucas, Harry… but Guy is where my heart lies. Wow, interesting choices for your shadows. Quite clever. I’d really like to see them! 😀 As for me, my shadow would be a question mark with a smiley face for the dot. I’m often a bit dazed and confused but wear a goofy grin on my face most of the time, LOL! I love that view..Richard and Richie..beautiful creatures! About your question, I’d like to have an eagle as my shadow. I’m quite sure my neighbours wouldn’t recognise me!